What is your first thought when you look at this? Mine? Crochet hook. I honestly thought “is that a crochet hook?” Does this mean I have a problem? 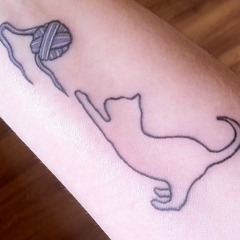 Is yarn taking over my subconscious? If you say no to that, let me tell you that my second thought (while still thinking it is indeed a crochet hook) was “awesome!” before my rational brain stepped in and pointed out that such a thing would be a) impractical, b) perhaps a little too odd for my tastes. This entry was tagged piercing, tattoos. Bookmark the permalink. I wasn’t an industrial accident of some kind? I like the tattoo, too. Lol, perhaps it was. But no blood, so I guess she decided to leave it in there? To each their own… I do like the tattoo. I was actually looking up ear tattoos when I found this, and I think it is a cute idea. Especially if I were to put a stud in the centre of the flower.